Rebirth for the iPad is a lovely mix of nostalgia and skeuomorphic digital design. Back from the days when making music was hard. Like fiddly and hard. But first an unnecessary history lesson. The Roland TB-303 was a step bass synthesiser, instrumental (pun fully intended) in the development of house music. You’ve probably heard it more times than you’d care to admit. The Roland TR-808 was a drum machine famous for its deep base and was cherished by hip-hop producers – think back to 2Live Crew or Licensed to Ill – or if that is too far back for you try Kanye’s 808’s and heartbreaks. It’s also on Marvin Gaye’s Sexual Healing. 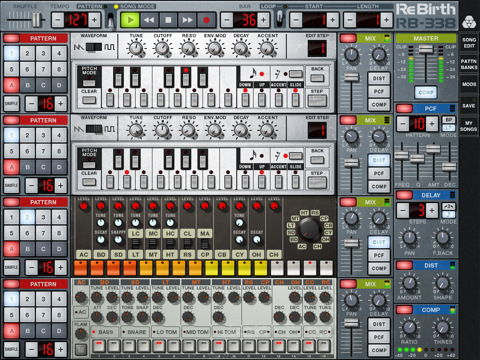 In the Mid 90s Propellerheads released a mindblowing emulator of the classic synth and drum machine combo, first for the Mac and then for a number of other platforms. And then, after years of success, for reasons best known to them Propellerheads ceased development. You don’t need to know any of this … but in a way aren’t you glad you do? No … ok I’ll get on with the review. Recently however, Rebirth was reborn as an iPad app – with iOS proving to be w fertile ground for emulation of classic software. The ReBirth app is an interesting trade off between Fidelity and usability. The 303 is fiddly and awkward to use – which is *exactly* like an actual 303. It’s like reuniting with a crotchety old friend. For an old, old, hand at synth programming, the emulation is as expected. For a new user opening the app, it could perhaps be a little overwhelming. It’s not exactly obvious how to thrown down a beat and step sequence feels like a massive leapt backwards on something as futuristic as a touchscreen tablet. There is a manual online, which, once you wade thought it, gives you a pretty clear layout of how to get up and running. The included songs are also pretty helpful at unlocking the musical potential of Rebirth. Mods are include, which change the look but also sound of Rebirth a little. 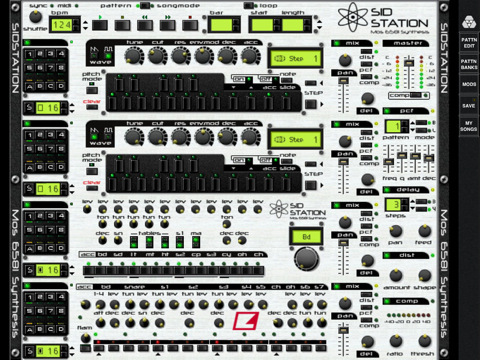 The original models being emulated are analogue synths, so of course the sound will never be *as* good. But the sound can definitely be filled under good enough. It’s a shame sharing options are a little on the limited side. I’m not so keen on getting a desktop complement and it would be great if they could publish directly to SoundCloud or Dropbox (everything should sync to Dropbox). 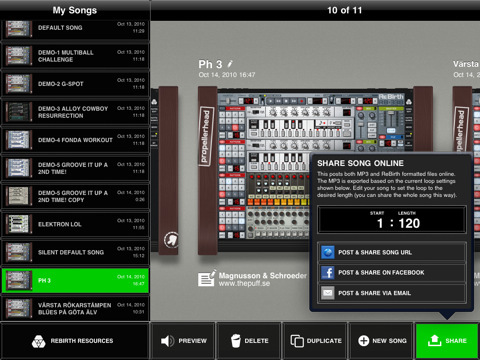 But you can upload mp3 versions of your compositions to the cloud and fiddle further with them after. Whilst not quite as good as the really thing, for a $14.99 iPad app, Rebirth is pretty amazing and a must for music enthusiasts who want a little piece of history in their jams. AppSafari review of Rebirth for iPad was written by Shem Pennant on February 15th, 2011 and categorized under App Store, iPad apps, Music. Page viewed 4298 times, 1 so far today. Need help on using these apps? Please read the Help Page.